There’s a great debate within the culinary community about whether butter beans and lima beans are the same thing. University of Florida's IFAS Extension argues the two are related, but butter beans typically come from smaller varieties, which tend to have a delicate creaminess. For optimal flavor and texture, nothing comes close to fresh butter beans, which makes the extra work of shelling them worth the effort. Butter beans, like other shell beans, are at their sweetest and most tender when they are young. Look for small, shiny, tightly closed pods. Store unwashed butter beans in their shell for 2 to 3 days in a plastic bag placed in the refrigerator. Rombauer, et al. recommend in The All New All Purpose Joy of Cooking, that if you buy fresh butter beans that are already shelled, only store them for 1 day before using them. If you're tempted to nibble on a raw bean, resist the urge. 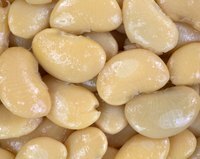 As is the case with lima beans, butter beans should never be eaten raw because they contain high levels of cyanide in their raw form. Before you can cook butter beans, you need to get them out of their shells. If you're shelling a large volume of butter beans, you might want to grab an extra set or 2 of hands to help make faster work of the beans. Keep in mind, you get approximately 2 cups of shelled beans for every pound of unshelled butter beans. Press along the inner curved area of the bean pod to split it open. If necessary, run your fingernail along the indentation to coax the shell open. Pluck the butter beans out of the pod and discard the shell. Keep an eye out and discard any pods that are very dry, or cracked; any beans that are hard and shriveled; or any beans that show signs of mildew spots. The shells can go right in the trash, or in your compost pile. You get the best flavor by shelling butter beans right before you cook them. In fact, while you're shelling the beans, put a large pot of water on to boil. Once it reaches a rolling boil, add the shelled butter beans, return the water to a boil and turn the heat down to simmer the butter beans for about 20 to 30 minutes, or until they are tender. Drain the butter beans, and toss them with butter, salt and pepper for a simple side dish. Alternatively, place the shelled beans in a steamer basket set in a pot filled with 1 to 3 inches of boiling water. Cover the pot and steam the beans for 15 to 20 minutes. For faster cooking, place the shelled beans in a microwave-safe dish along with approximately 1 tablespoon of water for every 1 1/2 cups of beans. Cover the dish and microwave the beans on high for 6 to 9 minutes until they are tender. Once the beans are cooked and tender, drain them and toss them with butter, salt and pepper for the simplest side dish. For a more Southern preparation, cook some bacon in a heavy skillet while the beans are simmering. Once the bacon is crisp, drain it on a plate lined with paper towels before breaking it into pieces. Discard all but 1 to 2 tablespoons of the bacon fat. Toss the cooked butter beans with the reserved bacon fat, salt, pepper and bacon. Another simple way to flavor the beans is to simmer them along with 1/4 pound of diced, salted pork and 1/4 cup of butter for every 2 quarts of beans. According to Rombauer, et al., pairing butter beans with onions enhances their richness. Other flavor affinities include chili peppers, peppers, tomatoes, savory, sage, parsley, thyme, bay leaves and garlic. The Kitchn: Good Question: What's a Butter Bean?